Monument and post commemorates the jubilee of the East-West Telegraph between Western Australia and South Australia. The first telegraph post of the Eucla line was erected in Albany by Governor Weld in 1875. On the 28th November 2001, a commemorative National Engineering Plaque was added to the monument. In 1874 the Western and South Australian legislatures voted the sums necessary for the construction of a Port Augusta SA to Albany WA line. Work began in April of the next year from Albany through country known to be practically waterless. At this time Western Australia had a population of 25,000 with total revenue from all sources being £135,000 per annum, from that was to come the estimated £30,000 cost of the line. South Australia's commitment was also significant, it had to complete the line across the vast Nullabor Plain. South Australia's parliament voted the funds approved on 4 November 1874 allowing the work to commence. The two lines met at Eucla, a location close to the Western Australia/South Australia border having encountered very substantial hardships and logistical challenges during construction. The line became operational on 8 December 1877. The telegraph operated for 50 years then with the introduction of electro-magnetic automatic repeaters and a more easily maintained telegraph line alongside the recently completed transcontinental railway line the line closed in 1927. 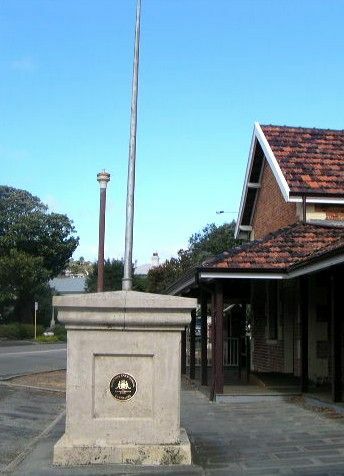 Outside, the Albany Post Office stands a post on a stone foundation which marks the starting point of the first telegraph line between Western Australia and South Australia. That post was formally erected on January 1, 1875, half a century ago. On the stone is the following inscription : — "This first post of the line to connect this colony with the Australian and European telegraphic system was planted by his Excellency Governor Weld on the 1st day of January, 1875." West Australian (Perth), 7 January 1925.